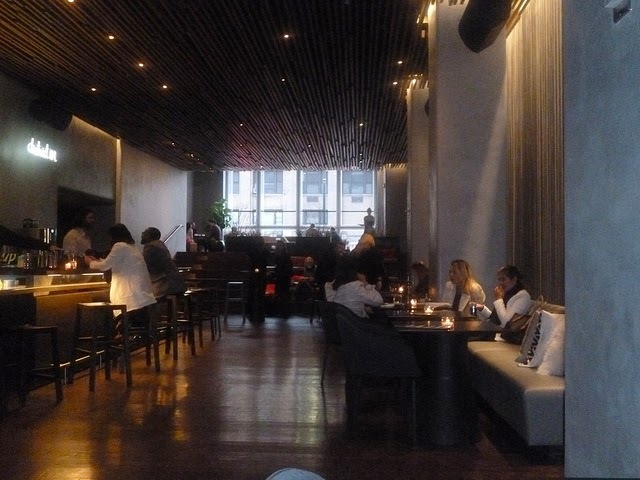 District M in the new Row NYC Hotel in Times Square is a hip yet unpretentious eatery/lounge on the main floor of this highly publicized and youthful hotel. There is stadium seating you can eat on (something that has only been seen before in Jay-Z's 40/40 eatery in Chelsea) as well as comfortable high table and banquet seating. The food comes out as fast as lightning and DJ Cherry spins jams from every era--she is actually a singer signed to Justin Timberlake's production company so we might be seeing very big things from her in the future. I enjoyed the dim lighting and high ceilings, which give District M a feeling of airiness--and all the menu selections are big enough to share. It's all casual quick food like pizzas and charcuterie but it's high quality and delicious. My dining partner Gail and I shared three appetizers and one handstretched pizza and together we could not even eat half the food. Gail started with the I'm Walking Here cocktail ($14), which consists of vodka, elderflower liqueur, white grape juice and lime. It was an unusual, fruity and refreshing drink. There are many unique District M cocktails including one actually called District M ($13) consisting of bourbon, ginger ale, pomegranate syrup and lemon, which is one of their most popular. Appetizers are served on long pieces of black slate that look like pavers you might find in your backyard garden. 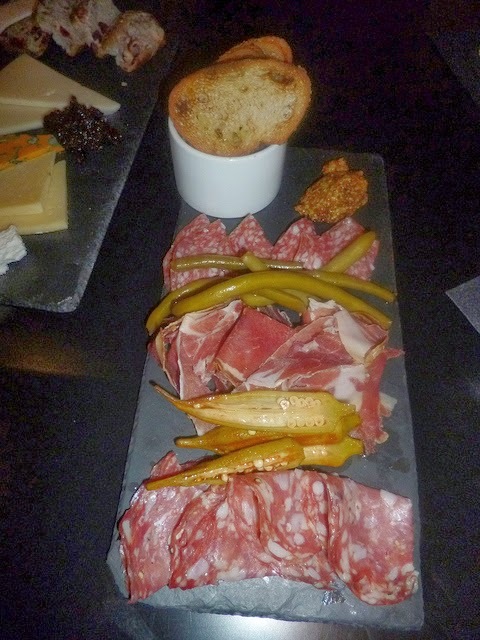 The Charcuterie ($16) came out first, and it consisted of a generous quantity of finocchiona, sopressata and surryano ham with sides of grain mustard, a sliced Pain d'Avignon baguette, brined string beans and okra. It was an ideal starter for a low carb dieter like myself. The surryano ham was sliced thin and especially moist--probably some of the best I have ever had. Next, the Cheese plate came ($15) which consists of tasty Selles Sur Cher, goat's milk, France Ewephoria, sheep's milk, Netherlands Jasper Hill, cow's milk and Vermont cheeses. On the side was wonderful sliced homemade cranberry walnut bread and balsamic pickled figs. This was one of the greatest variety of cheeses I have ever had on a NYC restaurant cheese plate and overall, there is probably 8 or 9 ounces of cheese in this generous portion. Then, my dining partner and I shared the Croque Monsieur ($16), which was a thick and heart sandwich served piping hot and gooey. It was basically melted Gruyere and Parisienne Ham on brioche bread but it was served with about 3/4 cups of baby lettuces with a vinaigrette and a side of delicious homemade Green Goddess dipping sauce. I dare say that this is the perfect warm sandwich for a cold New York day (or night)! 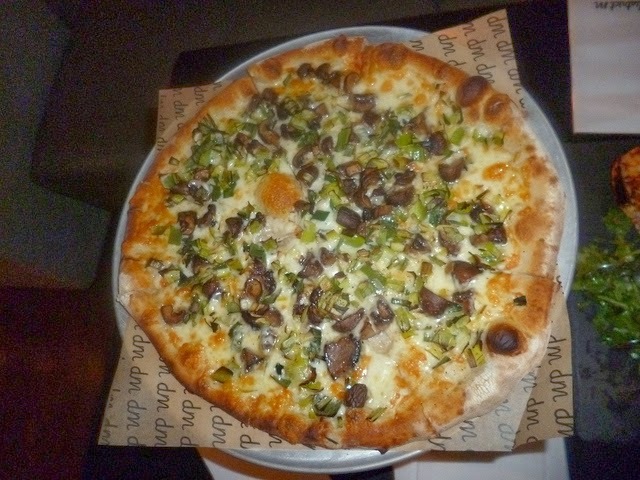 As our entree, we shared the M...Is For Mushroom Pizza ($16), which is the most popular pizza at District M. I was expecting a "personal size" pie but I would say it was at least 14 inches in diameter! The pizza was served on top of a wallpaper-covered can of San Marzano tomatoes that they use to make the sauce from and on the pie were luscious roasted cremini mushrooms, melted leeks and Fontina cheese that stretched like nobody's business. This pie was ultra-filling and one of the most creative ones I have come across lately! I had to check out the colorful rooms full of interesting pop art-inspired graphics on the walls and window shades while I was there. 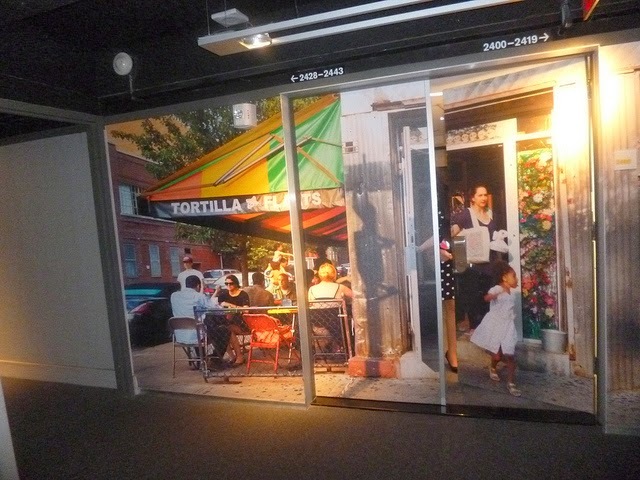 The hotel is themed on five great New York neighborhoods including Chelsea, East Village, Soho and the West Village so there are photo murals on the walls of every floor and rooms are painted the colors of five subway lines! I noticed in doing research on priceline.com, you can get a standard room for as little as $110 a night even though "rack rate" is $220. The hotel is generally at 98 per cent capacity due to its central location and while you are waiting on line to get your room, you will find a few extras to keep you entertained--there are Macs that you can use for free in the lobby close to the check in desk and often staff serves hot chocolate to anyone waiting in line. I recently checked out four levels of rooms and was stunned by the views of Times Square and the historic theaters in the area from each window. Toiletries are by PUR and while the hotel does not have amenities like a spa or pool, they do have a concierge and housekeeping staff that do things way above and beyond the call of duty. There is even a guest relations manager who can take you to see all different levels of rooms in case you want to upgrade. District M will soon be adding an eatery "neighbor" behind their stadium seating area, which will be inspired by the food stores of the Chelsea Market, and it will include a Murray's Cheeses. Celebrity photography by the legendary Ron Galella will be installed and projected all over the walls of District M, so be sure to come by for a visit between mid and late April. All hail District M and Row NYC--it's so nice to have happening hot spots in Times Square once more (and ones that are reasonably priced)!